Click image for information about this photo at archive.org's NASA collection. Among the files I received in a recent batch from Marshall Space Flight Center is a log book from the S-IC Test Stand from March 1965 through August 1967. It documents the daily activities involved in performing the various static tests of the S-IC-T (the static test) stage, S-IC-1 (which launched Apollo 4), S-IC-2 (which launched Apollo 6), and S-IC-3 (which launched Apollo 8), including the installation of engines, necessary repairs, and the actual test firings. 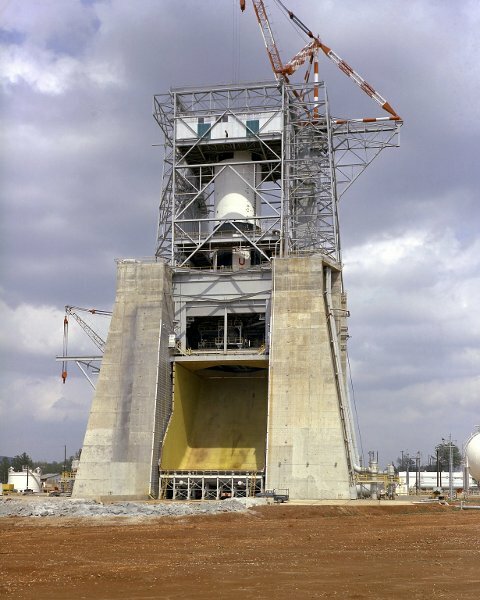 S-IC-3 was the last S-IC stage tested at MSFC; subsequent static testing took place at the Missisippi Test Facility (today named the Stennis Space Center). This log book consists entirely of text, without any photos or diagrams. The log book was scanned and converted to PDF by MSFC; heroicrelics performed the OCR (although there are a number of hand-written pages for which the OCR is of limited value). A web-resolution PDF for the casual visitor; 5.4 megabytes. View now. A full-resolution version for serious study; 11.5 megabytes. Download now.